Mr. Macaron E Liquid officially goes on sale to the public on September 12th, just a few short days from now. That being the case, as new brands usually do, Mr. Macaron sent out ejuice to dozens upon dozens of market influencers weeks ago, hoping to create enough buzz about the product prior to the launch. On platforms like Instagram I think they achieved it. In any case, everyone will be able to purchase this line in a matter of days. Finding information about Mr. Macaron was difficult. Other than images posted to Instagram and a few YouTube reviews, there is little known about the juice specifically, other than the brand is from Mad Hatter, makers of I Love Donuts and other “I Love…” ultra-premium ejuice. In the same package we received from Mad Hatter the one containing the award-winning Juice Box eliquid, (a collaboration between Mad Hatter and One Hit Wonder called OneMadHit) came several bottles of Mr. Macaron ejuice. Without anything to go on, we decided to put the ejuice in our review que and dug up what we could about it. A couple of weeks later we began the review process. About Macarons – Supposedly, these three flavors possess a ‘macaron’ base. An edible macaron consists of two main flavors, almonds and coconut. We could not detect any sort of macaron flavor in the three blends, though we definitely tried. 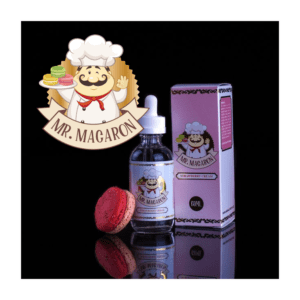 Mr. Macaron eliquids are “dessert flavors”. Heavy on flavor, heavy on vapor production, the line consists of a vanilla marshmallow, salted caramel, and a strawberry and cream. Each of the Mr. Macaron eliquids were packaged in 60mL glass bottles tucked inside a beautiful, full color box. Each bottle had highly detailed labels, and each was nicely shrink-wrapped. We do not have any pricing information at this time. Mr. Macaron eliquids are not blended as all-day-vapes, but the one that came closest to that was their strawberry and cream blend. Instead, these three eliquids are blended for maximum flavor. Unlike all-day-vapes, Mr. Macaron is almost overwhelming when vaped at high wattages and low resistance coils. But, damn, these three blends are absolutely delicious. The flavor components are authentic and unmistakable. The vanilla marshmallow tastes like vanilla marshmallows, the salted caramel IS salted caramel in vapor form, and the strawberry and cream is heavy on the cream, and mixed with sweet ripe strawberry flavoring. Because the line has not yet shipped, and their website is not open to the public, we cannot be sure of the VG/PG ratio, other than to say that all three were thick, aromatic, and golden in color. If I had to guess, I’d day at least 80% VG. Naturally, a heavy VG blend is going to produce a lot of clouds, especially with high performance sub-ohm tanks and RDA/RDTA devices with plenty of power pushed to the coils. Vapor alone is not enough for Mr. Macaron. All three produce strong aromatics, people sitting next to someone vaping vanilla marshmallow will smell vanilla marshmallows. The same holds true for salted caramel, and the strawberry and cream… if even for a few seconds. Flavor Chaser or Cloud Chaser? Mr. Macaron might appeal to both flavor and vapor chasers, but anyone insisting on all-day-vapes will be disappointed. I dare say that the entire team would max out on a particular flavor after only a couple of hours, with one exception… the strawberry and cream. The team received 60mL bottles so we had no problem reaching our 72-Hour review period where the only eliquid we vape is the one under review. By the end of the 72-hour period there wasn’t a drop to be found. The strawberry and cream eliquid lasted just 48 hours. Instead of a couple of hours at a time, strawberry and cream would vape nicely for half a day. Since the moment we ran dry we’ve been waiting for September 12th to place an order for more. 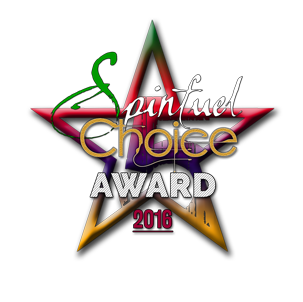 Each of the 3 flavors received the Spinfuel Choice Award for Excellence, you should know that upfront. Mr. Macaron is certainly a high quality brand, the packaging, labeling, safety was all first rate, but the real reason the Choice Award was given to each one was the exquisite flavors and the enormous clouds of vapor each one possessed. If any of the flavor descriptions below sound appealing to you, and your desires lean toward “full flavor” juice, then you will enjoy them as much as we did. Mr. Macaron is a High VG brand. The liquid is thick, too thick for plus ohm vaping, we believe. These eliquids are best used in sub-ohm tanks and RDA’s, with coil resistance levels at or under 0.5Ω. Depending on the tank/coil setup, the wattage can run from 35w to 150w. Keep in mind that in sub-ohm tanks it is no longer a simple matter of calculating the ohms to find the right wattage. As you’ll see below, our choices for tanks and coils required varied wattage levels to hit the sweet spots. Julia: Council of Vapor Tempest – Kanger ProTank 4 .5Ω ceramic coil at 37W, and the SMOK TFV8 0.16Ω at 110W. Tom: iJoy Lux and Lost Vape Triade DNA200, with the Starre PURE .25Ω at 70W, and SMOK TFV8 T8 coil 0.16Ω at 125W. Kiera: Lost Vape Therion DNA75 with the SMOK Baby Beast T8 core at 70W. Jason: Sigelei J150 with the Herakles Honor 1.6Ω coil at 70W. Julia: 5 Stars – If you’re a fan of salted caramel you’ll find that flavor here in abundance. This is definitely a rich flavor that cannot be mistaken for anything but salted caramel. Creamy, delicious, with thick aromatic clouds, you’ll want warm vapor in order to appreciate the sophisticated flavor contained in this fine eliquid. I wish I could say that Salted Caramel is a fine all-day-vape, but it just isn’t. This is a dessert vape, and as such you’ll feel sated and gratified after an hour or so of vaping the warm, thick clouds, then you’ll want to move on to something lighter. But while you are in the moment, it is a blissful, deep vaping experience. Tom: 5 Stars – I loved Salted Caramel by Mr. Macaron from the very first pull on the drip tip. I believe this is the first eliquid that claims to have a salted caramel flavor that actually delivers. This is not some caramel ejuice trying to pass off as salted caramel, you’ll know in an instant that its true to its name. There are times when you find an eliquid that goes straight to your pleasure center and opens the floodgates, and Salted Caramel is mine. Something about vaping such a deep rich dessert flavor that produces clouds of vapor so thick that it digs a hole in your brain and makes a home there. Don’t assume that because you enjoy caramel eliquids that you’ll enjoy Salted Caramel by Mr. Macaron. There is a big difference in salted sweet flavors, and if you’re a fan of salted sweets this is going to make you weep with joy. Jason: 5 Stars – Salted Caramel is definitely worthy of the Spinfuel Choice Award, and it will become a fast favorite for all the vapers out there that relish salty flavors. That said, I’m not one of them. I recognize the passion my fellow team members feel about Salted Caramel, all the ingredients to a “special” eliquid are there; rich, deep flavor, vapor so thick you’ll want to cut it with a knife, and that pure essence that refuses to reveal any artificial flavors, although they are certainly there. Julia: 5 Stars – This team has enjoyed more than a few delicious strawberry and cream eliquids before this one. Fortunately, or unfortunately, there are as many different flavor profiles for strawberry and cream as there are brands. This particular blend is much different than the Vaporfi/Cosmic Gog strawberry shortcake ice cream, though both could be said to be ‘strawberry and cream’ blends. Whereas the Vaporfi/Cosmic Fog was most certainly a delicious all-day-vape, this one from Mr. Macaron is not quite the all-day-vape. The strawberry and cream flavors, while authentic and natural, are quite a bit more intense, deeper, richer, as it is supposed to be. Strawberry Cream is a dessert flavor, with exquisite flavor and ample clouds of vapor. Tom: 5 Stars – I really enjoyed this full-flavored strawberry and cream dessert. You can taste the sweet, ripe strawberries as deeply as you can if you popped a real, ripe strawberry dunked in thick rich cream. When I consider the other strawberry and cream eliquids I’ve tried over the years I can’t remember one that layered on the flavor as much as Mr. Macaron. All three eliquids are definitely dessert blends, and as such there is no holding back on the flavoring. Luckily, the high VG blend produces as much vapor as it does flavor, so in an RDA or RDTA, you’ll fog up a room in no time, all the while giving your tastebuds a real workout. Kiera: 5 Stars – Strawberry and cream is almost an all-day-vape, and while I was reviewing it I was constantly talking to Julia about how I wish it was an all-day-vape. We recently reviewed a strawberry eliquid that was hand’s down an all-day-vape, and it was a blissful experience that didn’t let up. Mr. Macaron’s strawberry blend is at least 3 times as strong, flavor wise, so while any vaper will be hammered with a rich, creamy strawberry blend, I doubt many vapers will be able to keep vaping for an entire day. 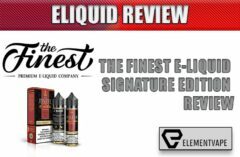 Jason: 5 Stars – This year has been a great one for eliquids. With the majority of experienced vapers moving to high wattage, low resistance vaping, the eliquid brands have kept up with the pace, shipping higher VG versions of their blends. That is especially good news for those eliquids we all love from 2014-2015 in a 50:50 or 60:40 PG/VG blend. Mr. Macaron’s strawberry and cream is loaded with strong flavors, but these flavors seem to melt on the tongue, allowing the flavor of a blended strawberry and cream to sort of seep everywhere. The exhale brings forth a wicked amount of vapor, and this vapor pushes past the tastebuds leaving behind that creamy rich aftertaste we look for. Julia: 5 Stars – Easily the strongest flavor of the three (though Tom thinks otherwise), Vanilla Marshmallow tastes exactly like a marshmallow dipped in vanilla extract. When I began vaping Vanilla Marshmallow I knew that it was too heavy to be an all-day-vape, but I so wished it could have. And although the flavor profile is strong in vanilla and marshmallows it wasn’t overwhelming. The problem with rich dessert flavors like these is that after vaping for a couple of hours the tastebuds go numb, leaving the vaper with only a powerfully sweet flavor. Those couple of hours are worth it though, and after a break of a few hours you can return to it and start all over. Tom: 5 Stars – I’ve experienced several marshmallow eliquids over the years and every time that real marshmallow flavor can’t quite make it through. This time, the marshmallow flavoring is as authentic as you can imagine. I expected the vanilla component to show up first, but in my time with this eliquid the marshmallow flavor was always the first out of the gate. During the exhale, and immediately thereafter, the sweet flavor of vanilla beans blankets the tastebuds, overtaking the marshmallow and forming a two-layer experience. Kiera: 5 Stars – Vanilla Marshmallow is the most decadent flavor of the three. Both the vanilla and the marshmallow flavors are strong, but distinct. I’m not so sure that my brain was dividing up the two flavors to bring order to my vape experience, but on the exhale it truly seemed as though one split second I was registering vanilla and the next marshmallow. And although I was not able to make it all day with vanilla marshmallow flavors, I wanted to. I think the perfect way to describe Vanilla Marshmallow is “too much of a good thing”. Jason: 5 Stars – Vanilla Marshmallow has about the same intensity in flavor as the salted caramel blend, but totally different in presentation. I suppose that’s because Salted Caramel is one flavor and Vanilla Marshmallow is two, but vanilla marshmallow is also a heavier flavor, which I did not expect, though looking back I should have. Vanilla Marshmallow, like the others, is a heavy, rich, creamy dessert eliquid. One that will deliver strong flavors and strong vapor production. You won’t need to think about the flavors you taste, you’ll know in an instant that you’re vaping marshmallows slathered in vanilla. There is little doubt that Mr. Macaron will find its way into a large segment of the vaping community, if its priced right. The brand has the support of Mad Hatter, and the marketing muscle, so people will be trying it. When they do, most will become loyal customers. In a proper eliquid collection you want all-day-vapes and non-all-day-vapes. There are times when we all need a thick, rich flavor like these three provide, and there are times when we need something lighter. The individual flavors are deep, and they should be vaped with warm vapor to reveal every little nuance in the blend, and they are all very satisfying dessert vapes. If you want to really taste the flavors in an eliquid, then by all means Mr. Macaron will not disappoint. While all three produce massive clouds, the ideal way to describe Mr. Macaron is to say that this is a line of rich dessert flavors, for flavor chasers. A reminder: Mr. Macaron is a High VG eliquid and the juice is thicker than you might expect. If you vape in the plus-ohm territory you might want to think twice about this line. On the other hand, if you’re looking for eliquid for those massive coil heads in the SMOK TFV8 or similarly equipped tanks and RDA’s, you found it in Mr. Macaron website. Julia Hartley-Barnes, Tom McBride, Kiera Hartley-Barnes, and Jason Little… The Spinfuel eLiquid Review Team.